The countdown clock may just have little over three years to go before the City of Culture tag formally kicks in, but in a buried corner of Coventry, the ‘c’ word is alive and buzzing. The Big Comfy Bookshop has been creating waves on the UK’s folk ‘n’ roots acoustic circuit for quite a while, and this is only likely to gather pace as we move into a new year. While a venue can make its own mark on a music scene, it is literally just another building without the artists that illuminate the everyday surroundings. The presentation that closed the 2017 Comfy and Acoustic twice-monthly programme worked a treat in terms of representing the breadth and depth of folk music the length of our land. 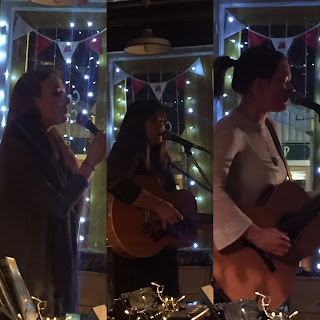 So let’s focus on the triumvirate of Iona Fyfe, Lucy Kitchen and Iona Lane, who loosely combined to celebrate the joy of unfiltered live music. Inevitably, the evening rolled out as billed, with a pair of co-opening acts effectively supporting the headliner in terms of afforded stage time. In a brace of thirty-minute slots, both Iona Lane and Lucy Kitchen set about sharing the span of their talent, which contained a mirror of contrasts and similarities. Lo-fi acoustic guitar and a golden voice were joint symbolic attributes alongside an inclination to veer towards contemporary original song writing. Identical ambience radiated from each performance as their style resonated with the ethos of the venue and the expectations of the audience. Without edging into judgemental circles, frequent fragments of individuality seeped out. An age differential led to Lucy coming across as a more steadfast performer, and perhaps making greater effective use of her guitar. It was deduced that her set comprised solely of original material, although there appeared to be a natural tendency to allow the songs do their own communicating. Without dispute, the set peaked with the final number. Via the introduction, Lucy revealed that ‘Searching for Land’ was her favourite track from the latest album and this explicitly transferred to the way the song was noticeably delivered. Prior to Lucy executing her impressive set, Iona Lane opened the evening with similar effect, although from a younger perspective of finding her feet in the professional world. This led to an assertion of being more experimental combined with an eagerness to embrace inter-song communication. Iona did wander into cover territory with a version of Sandy Denny’s ‘Who Knows Where the Time Goes’ , but her set was defined with a batch of revealing songs headed by the life changing ‘Amsterdam’. Essentially, she came across as an unblemished talent that will surely blossom with the passage of time. Maybe at this point in the evening a slice of variety was craved, so cue: the heaven sent Iona Fyfe. First up, it is wise to address the geographical differences, as we now had to embrace ourselves for an hour of staunchly traditional Scottish folk music in contrast to two sets with a particularly English flavour. Whatever the motivation for Iona to leave all remnants of instrumentation back north of the border for this gig excursion, it was an absolute blessing to spend a coveted hour in the precious company of her sculptured voice; effervescent charm and an endearing commitment to share her passion. The highest compliment to pay Iona is her ability to reach out and engage those who are not too au fait with the art of the traditional song, especially from the north east of Scotland. While folk clubs will soak this up, though reportedly occasionally in judgemental mode, this setting was far from that. At the end of the set, folks could start to sort their Child ballads from their Bothy ballads, alongside generating a further understanding of where this music is sourced. Not forgetting, all this was accomplished in the presence of a most captivating voice, plus the odd encouragement to ‘get yer singing’. The success of the latter was left to ponder, but the enthusiasm of the advocate was unequivocal. The jaw-dropping backdrop to this segment of the show, probably highlighted by a version of ‘The Banks of Inverurie’, was the aura generated by a performer yet to reach the ripe old age of twenty. Perhaps it shouldn’t be obligatory to expect a couple of Scots Gaelic songs, but as they are part of Iona’s current education drive, their presence was pleasantly welcome. The parting shot of this performance was learning that the countdown is underway to the release of a new album, complete with Celtic Connections launch night and a full band. As mouth-watering as this sounds, the value of turning up in the ‘soon to be’ culturally renewed Coventry with just the most basic of artistic tools and leaving an incredible indelible mark is one to never be under estimated.